Amidst a decade of social and political upheaval, the 1970’s laid the foundation for multiple musical styles that continue to captivate the world and influence today’s artists. Rock, pop, folk, soul, disco & punk all carved out their places on our radios and turntables. 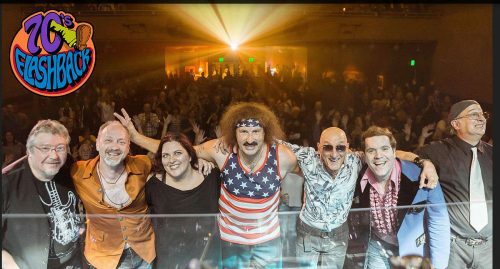 Comprised of 7 veteran musicians, 70’s Flashback pays tribute to the greatest groups and artists of the decade – and through their true passion for the music, bring that original excitement to both a new generation & to those who experienced it the first time! 70’s Flashback invites their audiences to step back in time, as they bring to life on stage this incredible soundtrack of a generation. From Carole King & Three Dog Night, to The Doobie Brothers & Led Zeppelin, to Studio 54 & CBGB – 70’s Flashback’s stellar harmonies & note for note musical re-creations leave their fans with a deeper appreciation for the music of this historic decade! Their high energy, show stopping performances continue to have audiences singing along to every iconic lyric, dancing in the aisles, and re-living the promise of the grooviest music ever written! Don't forget to join us on Sunday, November 11th at 11am for the annual Veteran's Day Celebration at the Rehoboth Beach Bandstand, sponsored by local VFW Post #7447. Content © City of Rehoboth Beach, 2019. All Rights Reserved.